Platelet rich plasma therapy is an exciting non-surgical modality for management of hair loss and works as an adjuvant to the hair transplantation. It is a part of hair treatment. 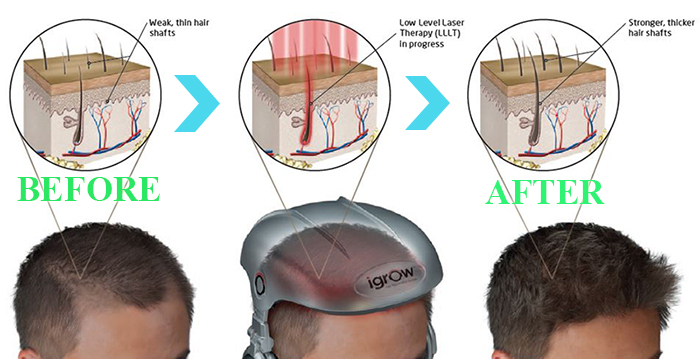 It not only prevents further hair loss but also stimulates actual hair growth. The growth factors in platelet rich plasma remove the inhibitory factors present in the scalp and stimulate the dormant hair follicles to grow again and new hairs grow over the bald areas. It is equally effective in both male and female cases of alopecia. Platelet rich plasma therapy has given excellent results in more than 80% of the cases, good results in 15% of the cases whereas 5% of cases had average to poor results. To get the maximum benefit PRP therapy can be combined with other modalities of non-surgical hair restoration. Human blood can be divided into two major components: plasma and cellular components. Plasma acts as a carrier of the cellular components of the blood. Platelets are an essential component of wound healing and repair. These growth factors lead to regeneration and growth of various cells which come in their contact including the stem cells and hair follicles. Stimulate the dormant hair follicles in the scalp and lead to the growth of new hair follicles and appearance of new hair over the bald scalp. Stimulate the mesenchymal stem cells and cause their differentiation into hair follicle cells and ultimately their conversion to hair follicles leading to new hair growth. 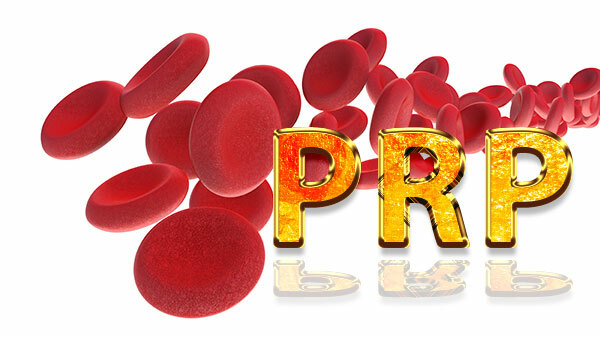 It is recommended to combine PRP therapy with Stem cell therapy to get the best results. 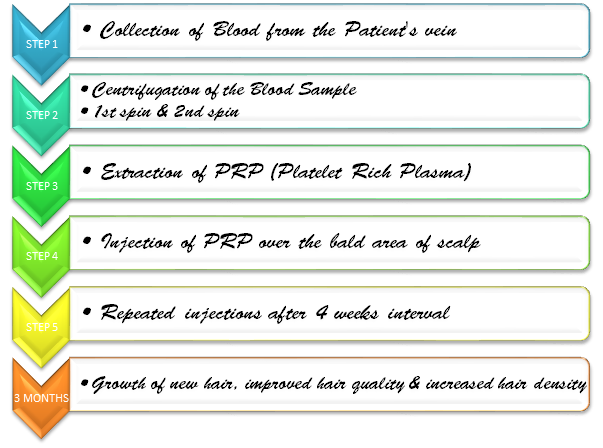 PRP is not a substitute for Hair transplantation but can avoid undergoing hair transplantation if started on time. How Frequently and for How Long the Platelet Rich Plasma Injections Are To Be Given? PRP injections are given at an interval of 4 weeks. Though results become apparent within 3 months, the PRP therapy is recommended to be taken for 6 months with once every year maintenance injections. 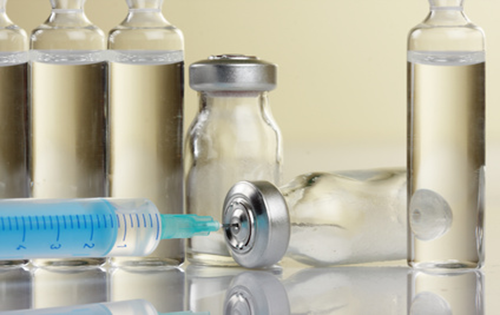 Over a period of decades, PRP therapy has established itself as an effective medical treatment modality in the specialty fields of oral surgery, neurosurgery, plastic and cosmetic surgery, sports injury medicine and orthopedics. It has been used extensively in these specialties with positive outcomes and success. In the field of hair restoration, there is evidence which supports the role of PRP therapy as a promising treatment option. While PRP is effective in hair restoration, it is not meant to replace the current FDA approved therapies such as DHT blockers and Minoxidil. Stem cells are the cells in our body which are capable of differentiating into different cell lines and produce specialised cell types. They have enormous potential to cure various disease and medical problems including baldness. Totipotent (total): Total potential to differentiate into any adult cell type and form specialized tissue needed. Pluripotent (plural): Potential to form most or all 220 differentiated adult cell types. Multipotent (multiple): Limited potential and forms only multiple adult cell types. 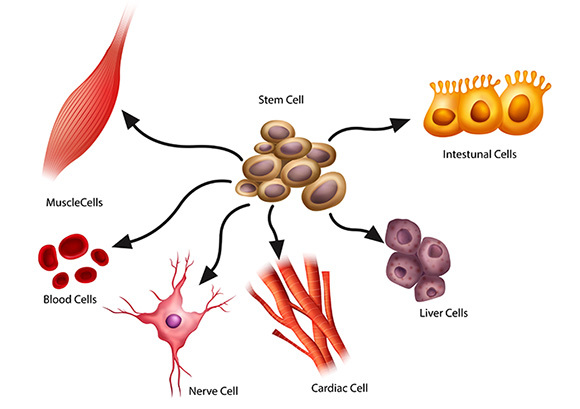 The various sources for harvesting Stem Cells in adults are: bone marrow, muscle, brain and adipose tissue. Among these adipose tissue is the richest and most readily available source of stem cells in adults. Next in the list comes the bone marrow derived stem cells. These are difficult to harvest and in adults are fewer in number as these cells undergo programmed cell death (apoptosis). Blood is also an important source of stem cells. Hair follicles also have stem cells in them but when these follicles get old or damaged then they can no longer take part in regeneration of new follicles. This can be due to various factors like hereditary, stress and ageing. The stem cells which are used to treat hair loss are harvested from fat or peripheral blood and these are called autologous stem cells. The stem cells segregated with PRP after centrifugation of blood are then injected into the bald area of the scalp using a microscopic needle. This stem cell therapy is outpatient treatment procedure and the patient can be sent home immediately the procedure. 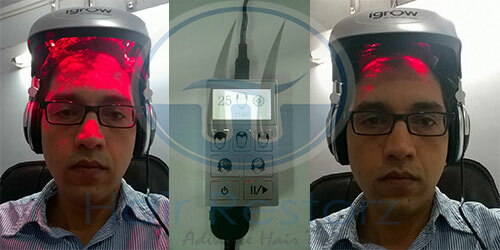 It is a revolutionary treatment for hair loss. The stem cells promote new hair growth within 3 to 4 weeks of treatment and the hair density increases by 30 to 40% after three sessions of treatment. On an average 5-6 sessions are required once in a week to 10 days. Done on outpatient basis taking not more than 30mins. Painless procedure with no scars. Androgenetic alopecia affects up to 30% of men below 30 years of age and approximately 50% of men above 50 years of age. The incidence of androgenetic alopecia seems to be increasing in women also. There is a significant psycho-social impact associated with hair loss and thinning of hair. There is a growing demand amongst the patients to seek treatment to prevent the existing hair loss and to regain new hair with good thickness, volume and density. About 40% of patients with androgenetic alopecia go bald inspite of conventional therapy with minoxidil and finasteride. Dermaroller is also known as Microneedling. It is a recent advancement to the treatment modality for androgenetic alopecia and hair loss due to other causes. The procedure is well tolerated and well accepted by the patients and is a cost-effective therapy for treatment of androgenetic alopecia and hair loss in both men and women. 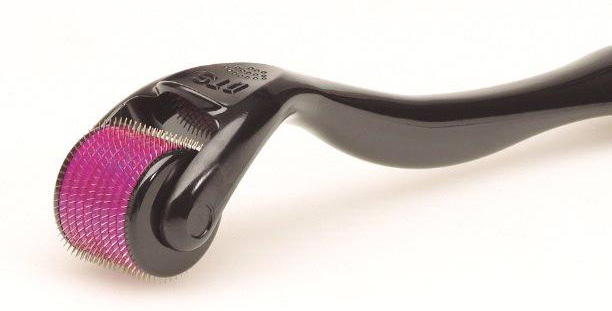 The standard dermaroller consists of a drum-shaped roller which is studded with 192 fine microneedles which are arranged in eight rows. The length of the needles varies from 0.20- 3.0 mm and has a diameter of 0.1 mm. The microneedles are usually synthesized by reactive ion etching techniques on silicon or medical-grade stainless steel. Dermaroller is presterilized by gamma irradiation. Release of various platelet-derived growth factor and epidermal growth factors by activation of platelets and skin wound regeneration mechanism. This helps to stimulate the formation of new hair follicles and increase the nutrition to the existing hair follicles. Dermaroller causes activation of stem cells in the hair bulge area which stimulates new hair growth. Post dermaroller there is overexpression of hair growth-related genes, vascular endothelial growth factor, B catenin, Wnt3a, and Wnt10. It causes formation of new capillaries (neo-angiogenesis) which helps to stimulate growth of new hair follicles. Increase in blood supply to the hair follicles also increases the supply of nutrients to the follicle, which in turn helps to nourish them. Topical application of products after dermaroller can increase their absorption by atleast 40 fold as compared to their application on intact scalp. Hence it is used for enhancing the percutaneous penetration and absorption of various hair growth products such as minoxidil, hair serums, platelet rich plasma etc. Treatment of androgenetic alopecia in both men and women. Treatment of other causes of hair loss such as telogen effluvium. Delivery of hair growth products to enhance their percutaneous absorption. Topical application of products after dermaroller can increase their absorption by atleast 40 fold as compared to their application on intact skin. 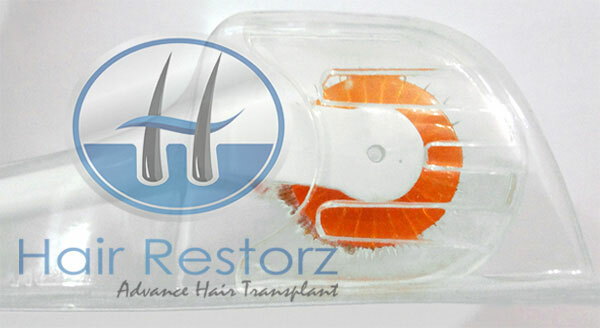 Post Hair transplantation surgery in order to stimulate and maintain the growth of transplanted hair follicles. For men it is best to get a haircut prior to the procedure as short hair will interfere minimally with the treatment. There is no need to get bald, just little shorter hair should be good. There is no need to be fasting or to be empty stomach for this procedure. Please have a good meal before you come for the procedure. 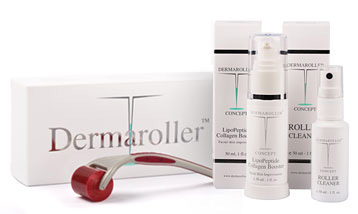 Treatment with dermaroller is a simple office-based procedure. Scalp is cleansed using betadine and spirit. 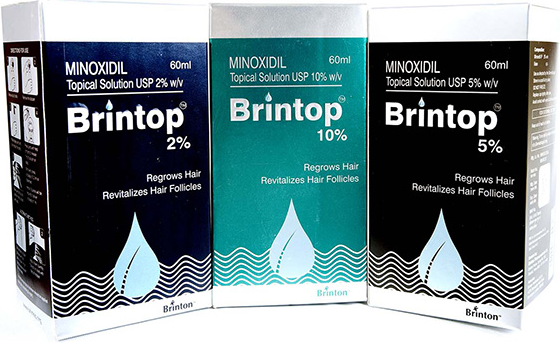 Topical Minoxidil solution is applied on the scalp. Dermaroller is rolled in the area in horizontal, vertical, and oblique directions until mild erythema and few pin point bleeding points are noted. The entire procedure lasts for 15 to 20 minutes. Immediately after this, topical minoxidil and hair growth serums are applied and massaged into the scalp inorder to enhance their penetration. Use of Platelet rich plasma can also be combined with dermaroller. The area is covered with an occlusive sheet for next 1 hour to enhance penetration of topical minoxidil and hair growth serums. The whole procedure from the time patient enters the hospital and leaves takes around 40 minutes. The patient can leave hospital and can remove the occlusive sheet by themselves after 1 hour. 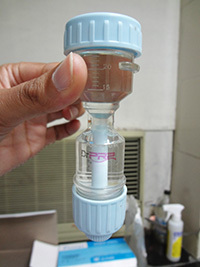 Treatment with dermaroller is usually well tolerated by the patients. As the microholes close immediately, postoperative infections do not occur. Cool ice packs may be applied to decrease post procedure discomfort which may be experienced by some patients. Patient can remove the occlusive sheet after 1 hour. The area may be cleansed with water and soap if the patient wishes, or can be left as it is. Though the treatment is usually well tolerated, patients can experience slight tenderness and pain in the scalp which can be treated with analgesics for 1-2 days. Scalp should be washed with shampoo on the next morning of the procedure. Slight erythema and oedema may be experienced by few patients which will subside in few hours to 1 day and can be decreased with the application of ice packs. Very rarely, few patients may experience enlargement of lymph nodes draining the scalp. In this case a course of antibiotics and analgesics may be required. It is advised to get 12-14 sessions of treatment with dermaroller at an interval of 2-4 weeks. For good results treatment plan for at least 6 months is advised. Post hair transplantation finasteride use potentially increases hair growth over the anterior and middle scalp areas. Finasteride also causes minimizing and even reversing the miniaturization process of hairs in the back of the scalp. Finasteride can also increase the density of transplanted hairs leading to improvement of the surgical results. The most common side effects of finasteride are reduced libido and erection. Finasteride are not very common and are almost totally reversible on cessation of the medication. Finasteride have been tested for pattern hair loss in women, but the results were no better than placebo.